Get up to date information on travelling in and around the area, including information on the coach restrictions within town. Stratford-upon-Avon is centrally located within England - just south of Birmingham, North-East of Bristol and North-West of Oxford. 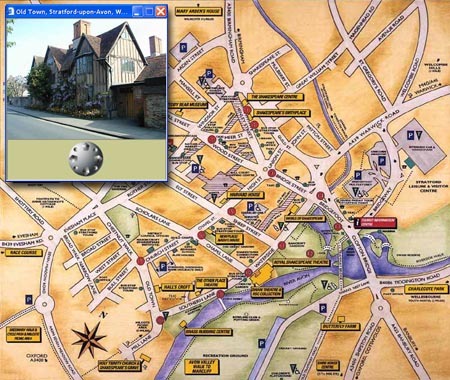 Travelling to Stratford-upon-Avon can be by road (see attached maps), by rail (Stratford-upon-Avon station is in the centre of town), by coach (see the National Express guide later) and even by boat. Warwick and Leamington Spa are 10 miles to the north, Evesham (and the M5) is 10 miles to the west, Oxford (and the M40) is 35 miles due South-West and Banbury is 25 miles to the East (also the M40). Travelling to Stratford by Boat is one of the most leasurely ways to arrive - the Stratford Canal connects with the Grand Union Canal to the north and down the River Avon to Evesham and beyond. You can also look around town using our walkabout system - click on the map above to turn on the 'Walkabout'. Rent a VW campervan and enjoy the freedom to get away from everything, great for families or couples and nothing gives you a greater sense of freedom to travel and relax in beautiful surroundings. We have a range of VW camper rental options on our VW Campers. If you simply want to rent one for a short break or longer holiday, please contact us with your needs and we will be delighted to set you up with a camper experience that will exceed your expectations. For something different - why not dine out on the Shakespeare Express. Our train departs Stratford-upon-Avon at 12:32 for Birmingham and returning at 15:01 we serve a 3-course Sunday lunch for the dining passengers.